You can apply various font decoration styles using the corresponding icons situated at the Home tab of the top toolbar. Note: in case you want to apply the formatting to the text already present in the document, select it with the mouse or using the keyboard and apply the formatting. Bold Is used to make the font bold giving it more weight. Italic Is used to make the font italicized giving it some right side tilt. Underline Is used to make the text underlined with the line going under the letters. Strikeout Is used to make the text struck out with the line going through the letters. Superscript Is used to make the text smaller and place it to the upper part of the text line, e.g. as in fractions. Subscript Is used to make the text smaller and place it to the lower part of the text line, e.g. as in chemical formulas. 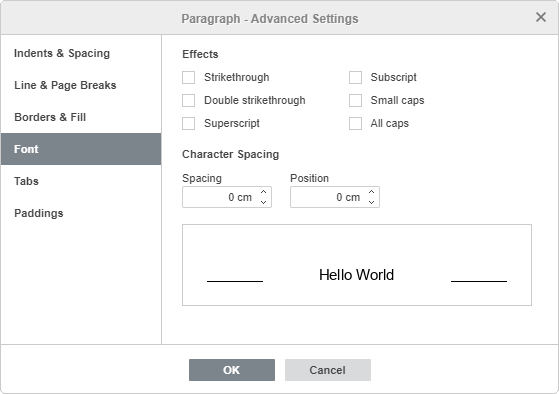 To access advanced font settings, click the right mouse button and select the Paragraph Advanced Settings option from the menu or use the Show advanced settings link at the right sidebar. Then the Paragraph - Advanced Settings window will open where you need to switch to the Font tab. Strikethrough is used to make the text struck out with the line going through the letters. Double strikethrough is used to make the text struck out with the double line going through the letters. Small caps is used to make all letters lower case. All caps is used to make all letters upper case. Spacing is used to set the space between the characters. Position is used to set the characters position in the line.